Mehmadabad, situated in the Kaira District of Gujarat, was founded in 1479 by Mahmud Begara who ruled in Gujarat from 1459 to 1511. The town was later improved by Mahumd III (1537-54) who built a large deer park here with a gilded palace at each corner. 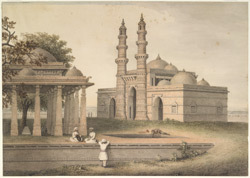 The painting shows a mosque and pavilion tomb both built in a style typical of the architecture of the Gujarati sultanate. The mosque has a rectangular sanctuary roofed with multiple domes. The central section has a high arched entrance flanked by two engaged minars and an additional gallery level topped by a high dome that creates a central rotunda over the main 'mihrab' or prayer recession within.